I just hacked together a new design for Browserling's web developer tools. Check it out! Tools are split into 12 categories: web tools, conversion tools, encryption tools, hash tools, password tools, text tools, randomization tools, image tools, time and date tools, math tools, other tools, all tools. I created these tools because all existing online tools were filled with ads, popups, malware and other garbage and idiotic configuration options that no one needs. 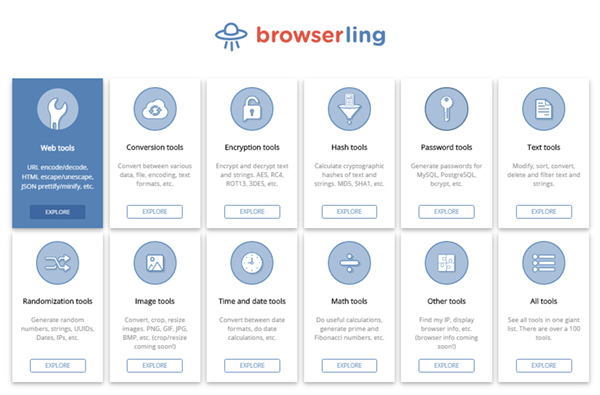 Browserling tools contain no ads, no garbage and no useless configuration options. All tools have the same interface with just one button. Press button, get result. Next up: uuencode, uudecode, generate random ipv6 addresses, jade-to-html, html-to-jade, base64 encode a file (not just a string), image-resize, image-crop, xor encrypt, bmp-to-gif, jpg-to-gif, png-to-gif, idn/punycode encode/decode, stand alone tools, embeddable widgets.